Happy Friday Everybody! I hope you guys enjoyed Tarte week :) I have two more products to review: Tartelette Palette & Poppy Picnic Palette, but I want to play around with them a little more before giving my final opinion. I'll have a post on Poppy Picnic next week. On another note, I have some REALLY exciting news! 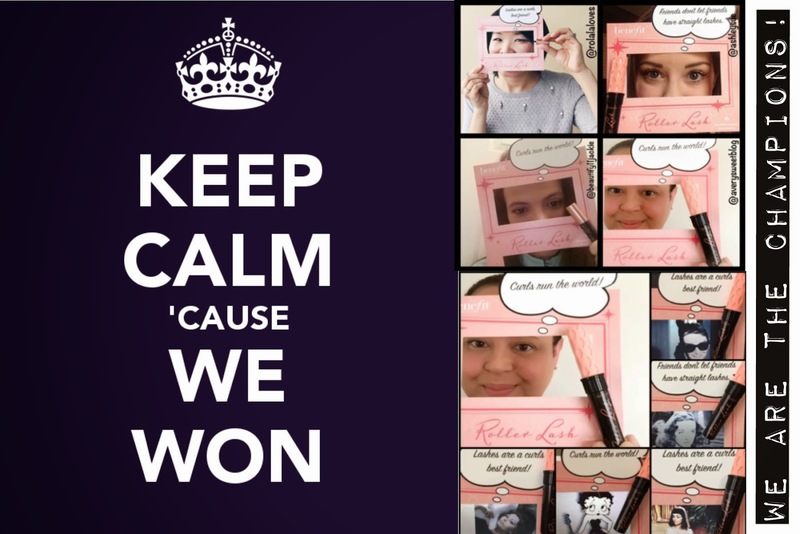 In April, I received several samples of Benefit's New Rollerlash Mascara through a Klout Perk. Klout then asked everyone that received samples to choose #CurlFriends to share them with. 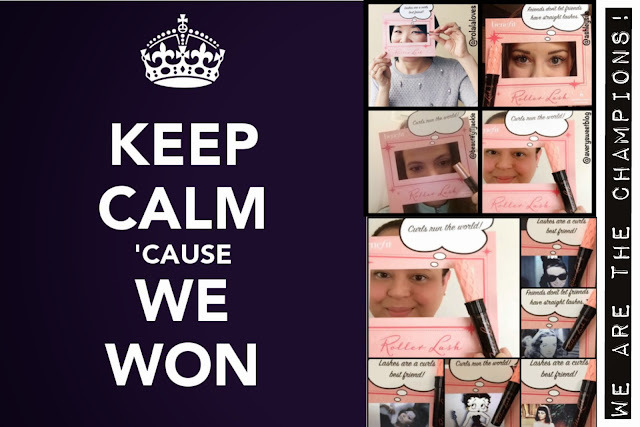 I shared mine with Rowena of Rolala Loves, Ashley of Ashley Sue Makeup and Jackie of Beautify Jackie Harrison. I also made an instagram video of classic actresses, who I thought would wear the mascara today and who I would choose as Curlfriends. Well Klout sent me an email and told me I was one of the winners (and they were shipping me a box of Benefit products to share with my Curlfriends)! They only picked 10 people out of all that participated. So I'm feeling extra special. I just received the box of Benefit goodies and I'll be sharing them with Rowena, Ashley and Jackie. So ladies, look for some beauty goodies in the next couple of weeks (feel free to use them for yourself, review & share them on your blog or giveaway). When I was going through the products, I didn't realize how many Benefit products I've never reviewed before. So I'll be doing a lot of Benefit reviews for you guys on here! HaHaHa I am SO happy! I want to thank Rowena, Ashley and Jackie for their participation! You ladies are the best! I'm so excited, I just might do a Periscope Broadcast later today (afternoon + evening), showing all the products! I hope you will join me. I'm listed as A Very Sweet Blog. If you do stop by, give me some hearts and remember what you type is recorded! HaHaHa Have a great weekend everybody! Great News Kim :) ,Congrats! Congratulations Kim, that's great news! PROUD OF YOU, MY DEAR! Well done! I LOVE Benefit! And can't wait for your opinion about your new treasures!!! You and your blog are always soooo sweet!!! <3 Happy Friday, love! This is awesome new the Friday could not start better I was please to participate doll you so deserve it. Can you send me that image you have here? by email to use when I review the products thanks YEAH!!!!KIM.... CONGRATS!!!! That is SO cool! Congrats to you and the ladies! So cool that they asked for Curl-friends to sure with! Love the pun! Awesome, Kim! Congrats and have a lovely weekend! That's so awesome! Congrats Kim! I would be going insane with joy! Hahaha! Hope you have a great weekend and enjoy your new goodies! Congratulations Kim! The win was definitely well-deserved. And it turns out it's a perk for us readers, too! I can't wait to see your upcoming Benefit reviews. Awwww! Congratulations dolls! I am so happy for all 3 of you. I cannot wait to see the goodies. Happy Friday, Kim! This is so awesome Kim!!! I'm so excited that you were picked as one of the winners!! And thank you so much again for including me in this! I'm so lucky to have a great friend like you!!! Wah that's fabulous news Kim! Yay and congratulations! Thanks again for choosing me to participate in this with you, Jackie and Ashley. It was fun! And thanks for all your hard work and creativity in the competition cause you made all this happen :) Happy weekend! Love your blog! Just followed you on GFC and Bloglovin, would you please follow me back? Congrats Kim!! And I can't wait for you to start reviewing those Benefit products. I'm always hesitant to purchase any of there stuff because the reviews are either great or really bad. I can't wait for the reviews girl. Yay! Congratulations! I love the cute pictures with the packaging! Wow, congrats on winning!! I'm even more impressed because I don't really get Klout and have tried to use it in the past because I know it's so popular so good for you. :)) And the other ladies too. I LOVE Benefit and I'm so glad they sell it overseas too. That's amazing Kim! Congratulations! I'm looking forward to your review of Benefit products. How awesome. Congrats to you. Hard work pays off and i am your your friends will be happy to be part of it. Congrats Kim!! Can't wait to see what they send you!! Happy weekend love! Congrats Kim! That's wonderful news! Have a great weekend! Congrats on your win! Benefit will soon be re-launching here in SA so we are all really excited about that, I've never tried any of their products before. Awesome news! Looking forward to reading your reviews on the Benefit products you received!